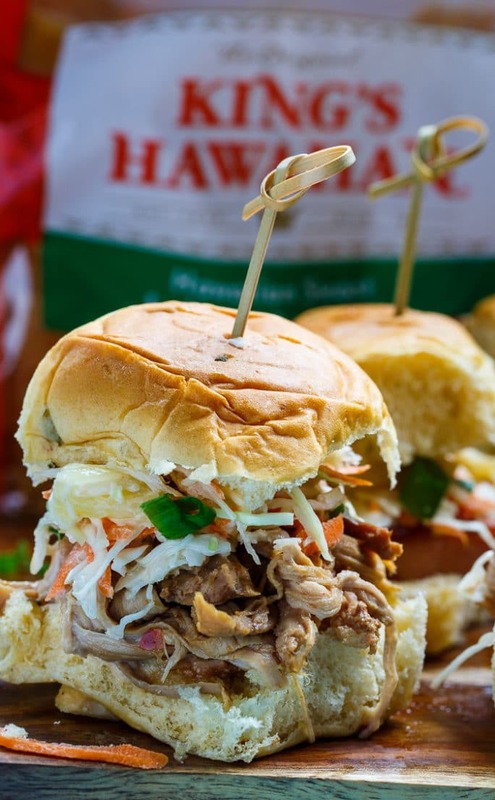 Two Kinds of Hawaiian Sliders, both topped with Tropical Slaw, are just the thing for celebrating Hawaiian Foods Week June 12-18. To make the sliders, I’ve used a Hawaiian-flavored pulled pork cooked in the slow cooker and slices of SPAM cooked until seared on each side and drizzled with BBQ sauce. 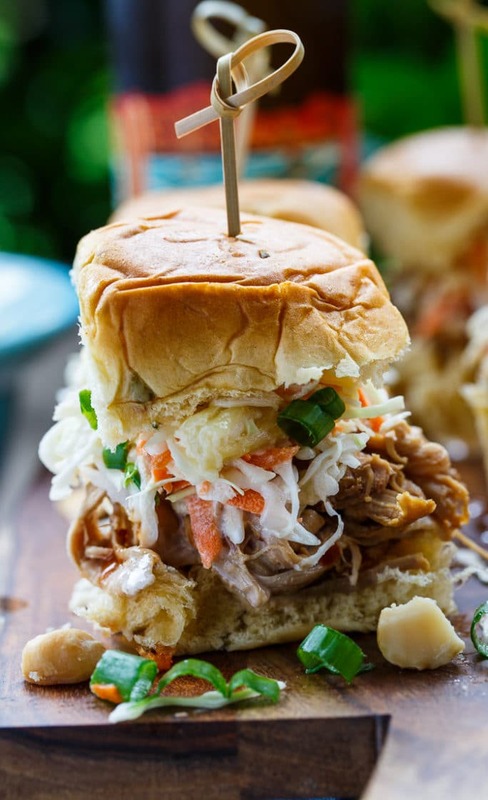 Each is topped with an easy Tropical Slaw flavored with pineapple and Macadamia nuts. Visiting Hawaii is something I’ve never done but is at the top of my bucket list. I’m determined to get there one day, but until I do, I will be enjoying lots of Hawaiian food. To make these sliders I used King’s Hawaiian Rolls which have been a favorite of mine for years. I love the sweet taste that they have and I was ecstatic to recently discover they have a jalapeno-flavored roll. I love the combination of sweet and spicy in these rolls. King’s Hawaiian also makes a delicious Sweet Pineapple BBQ Sauce Original which I used to make the pulled pork for these sliders. 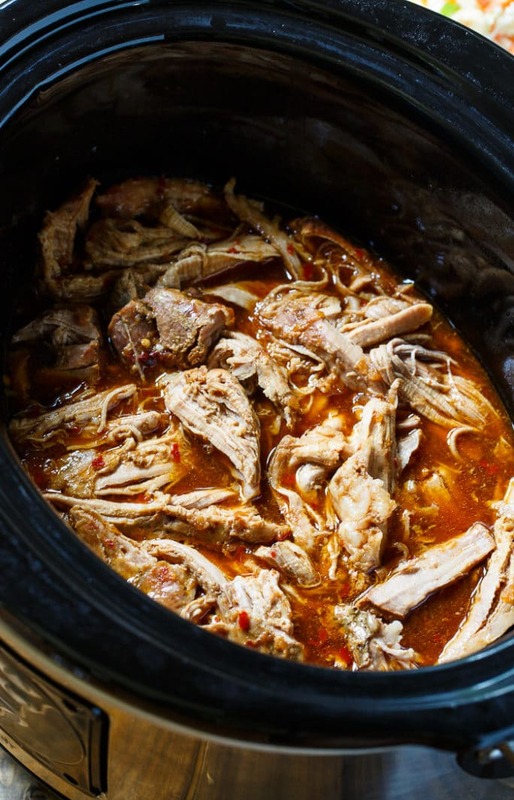 The pulled pork is super easy to make in your slow cooker. I used a couple of pork tenderloins because I love how lean they are and I added BBQ Sauce, soy sauce, brown sugar and red pepper flakes. That’s it! So easy and so delicious. In addition to pulled pork for these sliders, I also used slices of SPAM® Classic that I seared in a pan. SPAM® products are phenomenally popular in Hawaii where even McDonald’s has SPAM Brand items on their breakfast menu. For the Tropical Slaw, I made a simple dressing with mayonnaise, cider vinegar, soy sauce, and a little sugar and then added shredded carrots, green onions, chopped pineapple, and roasted Macadamia nuts. It is so simple to put together and I love the flavors, especially the pineapple and Macadamia nuts. When using pineapple in recipes, I love to use DOLE Pineapple Slices. Dole pineapple always tastes fresh and ripe making it perfect for using year round. For Macadamia nuts, I love the taste and high quality of Mauna Loa Macadamia nuts. Their first plantation was planted in Hawaii in 1946 and the first commercial crop was harvested in 1956. That’s a long time to wait for harvest! The average Macadamia nut tree takes 7 years to start producing and 10 years to reach full production levels. Mauna Loa also offers flavored Macadamia nuts including Dry Roasted Macadamia Nuts, Maui Onion Garlic and Honey Roasted. 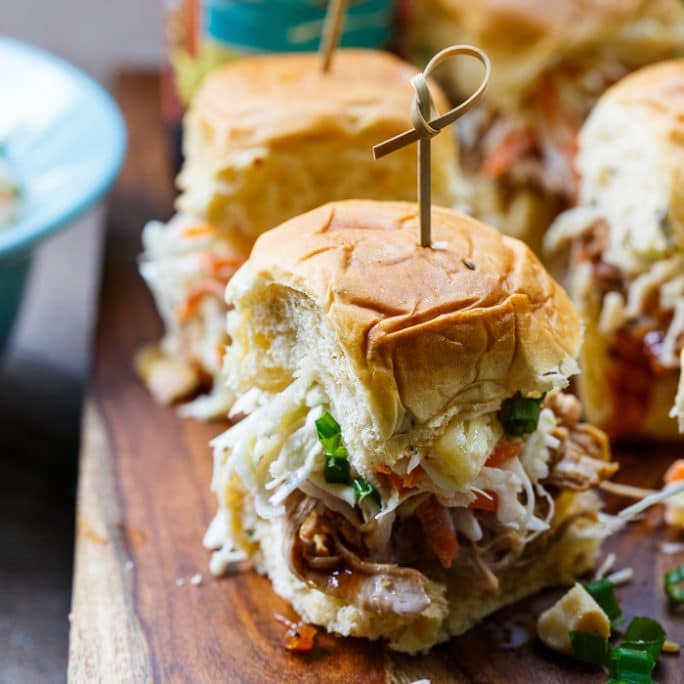 Hawaiian Sliders are perfect for your summer entertaining and they taste even better when paired with a cold Kona Longboard Island Lager. Made in Hawaii, this “Liquid Aloha” is just thing for pairing with Hawaiian foods. Two types of Hawaiian Sliders, both topped with a tropical slaw flavored wit pineapple and macadamia nuts. To make pork for sliders, lightly grease a crock pot insert and place pork tenderloins in crock pot. Mix together BBQ Sauce, soy sauce, brown sugar, and red pepper flakes in a bowl and pour into crock pot. Cover and cook on low 7 hours. Shred pork with 2 forks and continue to cook for 15 to 20 minutes. To make SPAM®, slice into 1/2 inch slices and cook until browned on both sides in a nonstick pan coated with Vegetable oil. Cut each piece in half so that it fits on the rolls. To make slaw, mix together mayonnaise, vinegar, soy sauce, and sugar in a large bowl. Add coleslaw mix, shredded carrot, pineapple, and green onions and stir to mix well. Sprinkle macadamia nuts on top and refrigerate until ready to use. 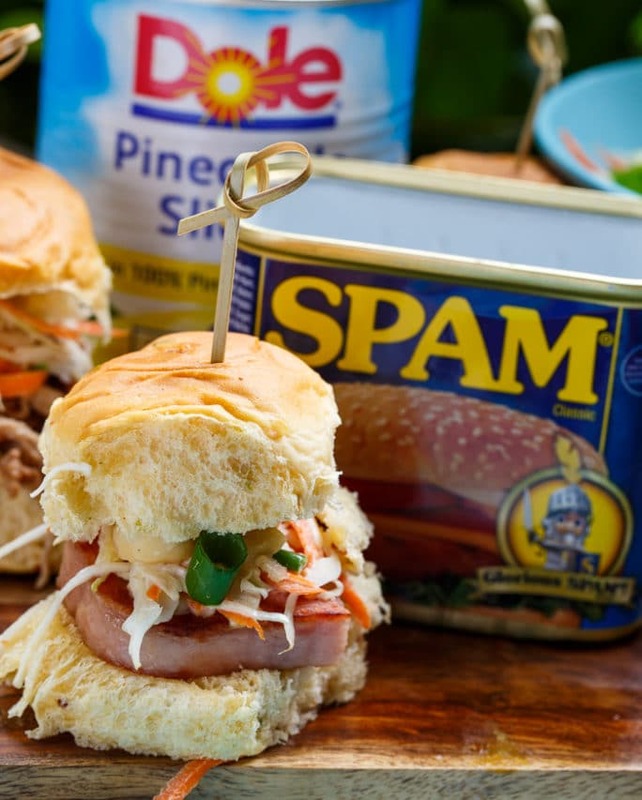 Cut rolls open and fill half with pork filling and half with SPAM® slices. Drizzle with BBQ sauce and top with coleslaw. This entry was posted in Appetizers and tagged Hawaiian, Pork. Bookmark the permalink. Love the sound of the tropical slaw! How fun is Hawaiian food week. I’m seriously off to buy some Kings Hawaiian rolls and now I’m gonna run! : ) This looks so delicious, perfect for summer eating out. The tropical slaw is such a special touch. If Hawaiian is in the title, I’m guaranteed to love it! 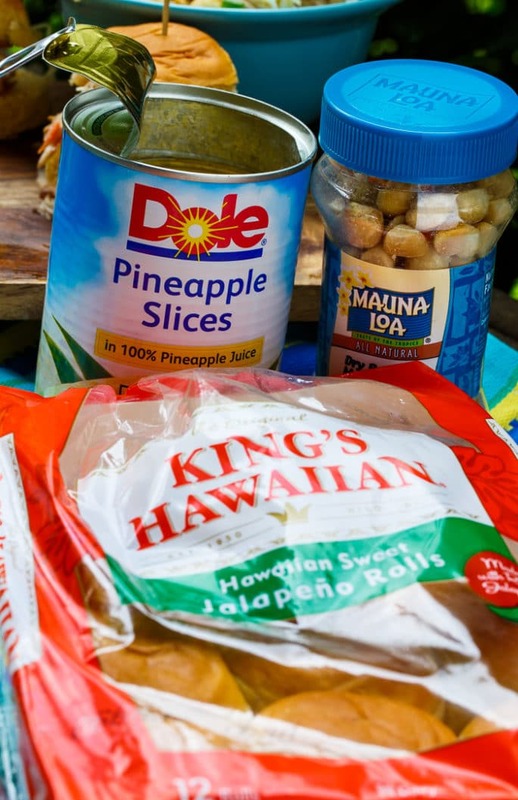 I love King’s Hawaiian and that slaw sounds so delicious with the macadamia nuts! We buy the King’s Hawaiian Rolls all of the time too, other brands just don’t compare! 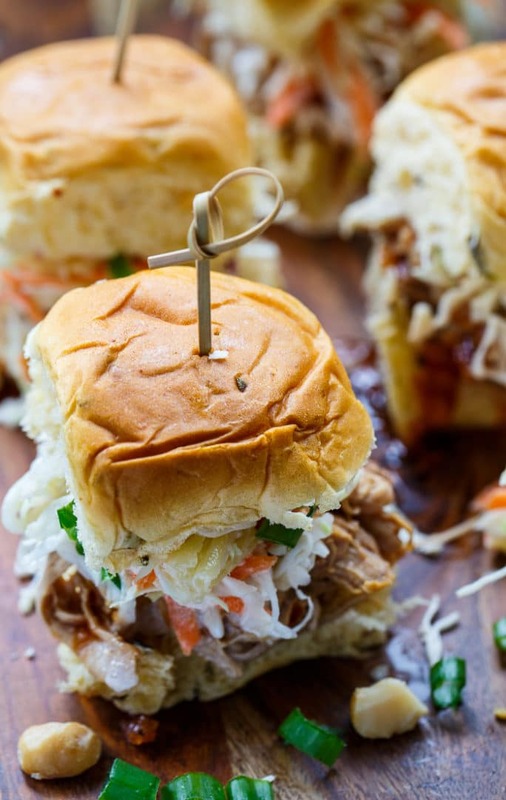 I’m loving that tropical slaw on top, it’s such a perfect touch to these little sliders. I went to Hawaii for my honeymoon three years ago and it was amazing! I’m trying to convince my husband to go back for our 5 year anniversary! 🙂 These sliders look delicious! Such perfection for an easy appetizer! It has been so long since I’ve made sliders! They always seem so perfect for summer. Loving the sound of that tropical slaw! Yum! These look great. I really like unique slaws, so I need to try this one! I could eat macadamia nuts by the bowl.